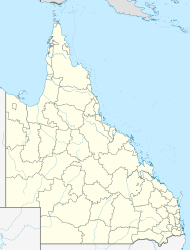 Mount Garnet is a small town and locality in the Tablelands Region in north-eastern Queensland, Australia. In the 2011 census, Mount Garnet had a population of 433 people. Mount Garnet's population is around 400 people with 35% being Aboriginal. Various small communities populate the area around Mount Garnet. These include Tableland Tin, Innot Hot Springs, Silver Valley and Battle Creek. Mount Garnet is at the south-western edge of the Atherton Tableland and on the Kennedy Highway. Mount Garnet is about a three-hour drive from Cairns. Mount Garnet is 161 kilometres (100 mi) south-west of Cairns via the Bruce Highway, Gillies Range Road, Lake Barrine Road, State Route 25, State Route 24 and the Kennedy Highway. From further west it can be accessed via the Kennedy Highway. Mount Garnet is situated on the traditional lands of the Mbarbaram peoples. Mount Garnet was built as a mining community in the 19th century and several minerals can be found in the area, including tin, copper, zinc and garnet. Garnet Hill is situated a few hundred metres from the state school, was a main vein of tin and garnet in the late 19th century. Open mine shafts still litter the hill only covered with sheets of tin. In 1882 Albert Vollenweider discovered copper (and garnet) in the area formerly known as Mullaburra Station. He mined the copper in a small-scale operation but he later sold his lease to John Moffat in 1898. By 1899 Mt Garnet Freehold Copper and Silver Mining Company was producing high grade copper oxide. The township was surveyed and buildings sprang up making the township the second-largest inland town (Charters Towers being the largest). By 1906 the company was in financial difficulty and closed. People were moving away for work, buildings were being moved to other mining towns until the mining of the rich veins of tin, which was first discovered in 1901, started to take off. The town began to flourish again. Mount Garnet Post Office opened on 25 July 1899 (a receiving office had been open from 1897). Tin became the important mineral for the town. In 1928 a coal-fired dredge was built but didn't prove to be so successful losing more ore it retrieved. Eventually it sank in a flood. It was later refloated and adapted but eventually abandoned. In 1938 Tableland Tin Dredging N.L. established a new electrically-driven dredge, Nanyeta, later to be replaced by Nanyeta II. By the early 1950s another dredge owned by Ravenshoe Tin Dredging was in operation. Tin carried the town until 1986 when the price dropped forcing many families to move away. In 2000 the original copper mine was reopened with copper, zinc, lead, and silver being processed by Kagara Limited. In 2012 Kagara Limited went into administration and was bought out in 2013 by Snow Peak Mining Pty Ltd, an Australian company with strong Chinese shareholding, with the mine being operated by Consolidated Tin Mines. They will eventually process tin. Another tin mining company, Mount Garnet Tin Resources (MGT), has a tin processing plant, Mt. Veteran. This plant was built in 1980 and had been used intermittently until the recent resurgence in the tin price. MGT purchased it and are processing high grade tin. Mining isn't the only industry at Mount Garnet, some of the best cattle producing properties are in the district. Crops of mangoes, corn and other crops are grown on the nearby Herbert River. Blenco Falls on the Herbert River can be accessed from many of these cattle properties. In 1938 land was donated to the people of Mount Garnet to use as a sports reserve. A grand racecourse was built. It and rodeo grounds were used by the troops for R & R during training in WW2. Soldiers volunteered their help with any construction needed. In return cattle station owners provided horses and bulls for their entertainment with races and rodeo. Passby parades of the troops were held there when General Blamey came to inspect the troops. This reserve now boasts a first class rodeo ground, racecourse and golf club, the greens being inside the racetrack, and permanent camps. These camps are controlled by trustees (Trustees of the LD Lucy Memorial Park). 2013 is the 75th year that the races have been run. Not far from the base of Garnet Hill on the south east side is Warruma Swamp. This wetland is home to many variety of birds. Originally Warruma was a swamp and boasted a water source that never ran dry. Now it is used for a water supply to the township. Fresh water is continually pumped from the Herbert River into Warruma, then pumped out of there into holding tanks for the town supply. At the 2006 census, Mount Garnet had a population of 458. A railway was authorised to be built from Lappa, on the then Chillagoe Railway and Mines Company's line, to Mount Garnet by the Mount Garnet Freehold Mining Company in 1897. It suffered a rather shaky construction period and it was not until 11 January 1904 that the line was ready as far as a flood-damaged Return Creek bridge, across that creek from the town. It took another eleven years before trains could officially negotiate the bridge to the Mount Garnet station. The line was taken over by the Government from 23 December 1914. It closed on 1 July 1961. During the life of the railway, minerals, timber, cattle and crops were moved to coastal ports and goods, mining machinery were brought in. The railway bridge at Mount Garnet, which ceased being used in 1961, was demolished by the big flood of 1967. The remains can still be seen in Return Creek. The rail track was lifted in 1961 and is now used as a vehicle road to Lappa Lappa Junction. This road is only negotiable by four wheel drives but is a very nice drive. Culverts along the track were remarkably made by stonemasons and still stand with many still serving their purpose by channelling water through to creeks and gullies. Today, the transport comes in the form of semi's and trucks. Being the "Gateway to the Coast" and "Gateway to the Gulf", this section of the Kennedy Highway is quite busy, particularly when the Bruce Highway is closed from flooding. In the 1930s several cattle stations were established within the community as well as farms that grew many crops, including tobacco, potatoes, corn and peanuts. Various mining operations, as well as lime production, are in operation today just outside the town. The Mount Garnet branch of the Queensland Country Women's Association meets at QCWA Hall at 16 Garnet Street. ^ a b Australian Bureau of Statistics (31 October 2012). "Mount Garnet(SSC)". 2011 Census QuickStats. Retrieved 8 June 2016. ^ Premier Postal History. "Post Office List". Premier Postal Auctions. Retrieved 10 May 2014. ^ Australian Bureau of Statistics (25 October 2007). "Mount Garnet (L) (Urban Centre/Locality)". 2006 Census QuickStats. Retrieved 13 June 2011. ^ "Coolgarra Battery (entry 601791)". Queensland Heritage Register. Queensland Heritage Council. Retrieved 14 July 2013. ^ "Gunnawarra Homestead (entry 600544)". Queensland Heritage Register. Queensland Heritage Council. Retrieved 14 July 2013. ^ "Nettle Creek Tin Dredge (entry 601534)". Queensland Heritage Register. Queensland Heritage Council. Retrieved 14 July 2013. ^ "Mt Garnet Mine Assay Office (former) (entry 600543)". Queensland Heritage Register. Queensland Heritage Council. Retrieved 14 July 2013. ^ "Opening and closing dates of Queensland Schools". Queensland Government. Retrieved 18 April 2019. ^ "Branch Locations". Queensland Country Women's Association. Retrieved 26 December 2018. This page was last edited on 18 April 2019, at 23:26 (UTC).